The Differential Expression Import Service facilitates upload of user-provided, pre-processed differential expression datasets generated by microarray, RNA-Seq, or proteomic technologies to the user’s private workspace. From there the data sets can be analyzed using annotations and analysis tools for comparison with other expression data sets in PATRIC. 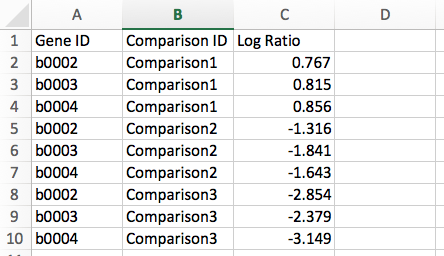 Currently, PATRIC only supports differential gene expression data in the form of log ratios, generated by comparing samples/conditions/time points. The Expression Import submenu option under the Services main menu (Transcriptomics category) opens the Expression Import input form (shown below). Note: You must be logged into PATRIC to use this service. The Expression Data Import Service can also be accessed via the PATRIC Command Line Interface (CLI). Allows upload a data file containing differential gene expression values in the form of log ratios. The file should be in one of the supported formats described below. Optionally, you may also upload metadata related to sample comparisons in the prescribed format to provide additional context for data analysis. See Optional Metadata. 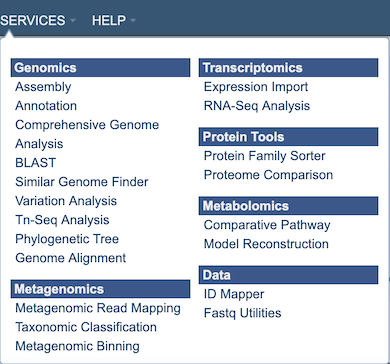 Dropdown list specifying the the experiment type, either Transcriptomics, Proteomics, or Phenomics. Option for specifying if the data set is for bacteria/archea, or alternatively, eukaryotic host. Dropdown list for specifying the source ID type, e.g., PATRIC ID, NCBI Gene ID, RefSeq Locus Tag. Used to map genes to genes in PATRIC, allowing integration of other PATRIC data in PATRIC into the analysis. Due to differences in annotation that may exist, some genes may go unmapped. Unmapped genes will be excluded from subsequent analysis. 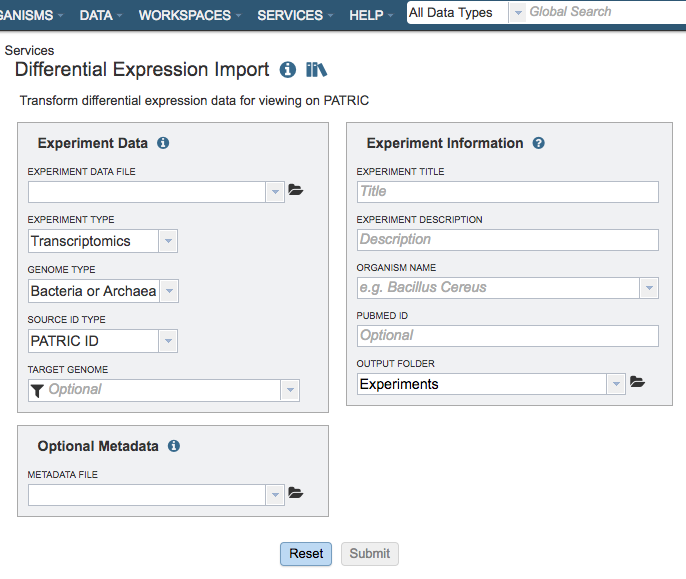 Option for mapping the expression data to a particular genome in PATRIC. This will facilitate inclusion of other expression data in PATRIC for that genome in subsequent analysis. Metadata to specify the experiment title, description, organism, and Pubmed ID (optional) for providing contextual information for the uploaded data in PATRIC. Title for the experiment (required). Description of the experiment (required). Taxonomic name of the organism associated with the uploaded data. Pubmed ID associated with the uploaded data, if available (optional). Folder in the Workspace where the uploaded data file will be located. The default is /home/Experiments. Allows upload of an additional file containing key metadata attributes about the comparisons. This will enhance your analysis when using the heatmap and clustering tools. The metadata table can be uploaded as a tab/comma-delimited or Excel file. Note: The column names should be the same as in the example template. Also, comparison IDs in the metadata file should match those in the data file. Click to download the Metadata Template. Reset: Resets the input form to default values.